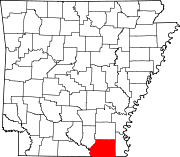 Ashley County is a county located in the U.S. state of Arkansas. As of the 2010 census, the population was 21,853. The county seat is Hamburg. The county was formed in 1848 from parts of Chicot, Drew and Union counties and named after Chester Ashley. It is an alcohol prohibition or dry county. Ashley County, the fifth-largest county in Arkansas in terms of land area, was formed on November 30, 1848 from portions of Drew, Chicot and Union Counties. It was named after Chester Ashley, a US Senator and land speculator. The final borders were laid in 1861. The courtroom in the courthouse has a one-of-a-kind architecture: it is round, and the seats are arranged so that members of the audience can always see each other. Ashley County is split between two geographic regions, divided by the Bayou Bartholomew. The rich, fertile, alluvial soils of the Mississippi Alluvial Plain extend into the eastern part of the county. In Arkansas, this region is called the Arkansas Delta (in Arkansas, usually referred to as "the Delta"), having a distinct history and culture from adjacent regions. West of the Ouachita, Ashley County is characterized by forests of shortleaf pine and hardwoods typical of the Gulf Coastal Plain. In Arkansas, this region is referred to as the Arkansas Timberlands, a subdivision of the Piney Woods. According to the U.S. Census Bureau, the county has a total area of 941 square miles (2,440 km2), of which 925 square miles (2,400 km2) is land and 15 square miles (39 km2) (1.6%) is water. The lowest point in the state of Arkansas is located on the Ouachita River in Ashley County and Union County, where it flows out of Arkansas and into Louisiana. The county is located approximately 58 miles (93 km) north of Monroe, Louisiana, 118 miles (190 km) south of Little Rock, and 158 miles (254 km) northwest of Jackson, Mississippi. [Note 1] Ashley County is surrounded by Drew County to the north, Chicot County to the east, Morehouse Parish, Louisiana to the south, Union Parish, Louisiana to the southwest, and two Timberlands counties; Union County to the west and Bradley County to the northwest. Water is an extremely important part of Ashley County's geography, history, economy, and culture. The many rivers, streams, and ditches crossing the county have featured prominently since prehistoric times, and many archaeological sites, including the Lake Enterprise Mound from the Archaic period, are along waterways. Many early white settlements, including Berea, Arkansas, were founded along waterways, but many faded as railroads eclipsed waterways as the favored mode of transportation. Ashley County is split among four watersheds: the lower Saline River in the northwest, lower Ouachita River in the southwest, Bayou Bartholomew across the majority of the county, and the Boeuf River along the eastern edge. The Saline River serves as the northwestern boundary of the county before emptying into the Ouachita River, which serves as the southwestern boundary. The Port of Crossett is positioned just south of the Saline River's mouth. Within the county, Bearhouse Creek, Chemin-a-haut Bayou, Fountain Creek, Flat Creek, Mill Creek, and Overflow Creek are important watercourses. Ashley County contains Overflow National Wildlife Refuge, part of the Felsenthal National Wildlife Refuge, and four Wildlife Management Areas (WMAs) under Arkansas Game and Fish Commission jurisdiction. Beryl Anthony Lower Ouachita WMA preserves seasonally flooded bottomland hardwood forest habitat along the Ouachita River between the Felsenthal NWR and the Louisiana state line for preservation, recreation, and hunting opportunities. Duck hunting, especially when the Ouachita River floods, is the primary hunting opportunity due to the site's position along the Mississippi Flyway, with deer and squirrel hunting also available during the year. Most of the 7,020 acres (2,840 ha) is on the Union County side of the Ouachita River, leaving the only public access to the Ashley County area via boat. A small segment in Ashley County contains the Coffee Prairie Natural Area, owned by the Arkansas Natural Heritage Commission. The Casey Jones Leased Lands WMA is a common name for five fragmented parcels in Ashley and Drew counties established in 1988. The two largest segments in Ashley County are south of Crossett and in the northwest corner of the county, with a small area northwest of the Overflow WMA also included in Casey Jones WMA. This lease includes segments of working forest actively managed for forest products, primarily by single tree selection. Habitats range from upland pine to bottomland hardwood depending upon location. Deer and turkey hunting are most common in the WMA. Little Bayou WMA is located in northeastern Ashley County along the western banks of Bayou Bartholomew at the mouth of Little Bayou. The area contains a boat ramp on Bayou Bartholomew, as well as birding, camping, fishing, and hunting. The former agricultural area was replanted with bottomland and upland hardwoods, short-leaf pines, and native warm season grasses in the 1990s. The Crossett Experimental Forest is a 1,765 acres (714 ha) property donated by Georgia-Pacific Corporation in 1934 to research forest management in second-growth loblolly pine and shortleaf pine forests. Within the Forest is the Reynolds Natural Area, a stand that has been largely untouched since the area's creation in 1934. The property is managed by the Southern Research Station of the United States Forest Service. As of the 2010 census, there were 21,853 people, 8,765 households, and 6,227 families residing in the county. The population density was 23 people per square mile (9/km²). There were 10,137 housing units at an average density of 11 per square mile (4/km²). The racial makeup of the county was 69.3% White, 25.8% Black or African American, 0.3% Native American, 0.5% Asian, 0.2% Pacific Islander, 3.2% from other races, and 1.1% from two or more races. 4.9% of the population were Hispanic or Latino of any race. There were 8,765 households out of which 33.9% had children under the age of 18 living with them, 51.5% were married couples living together, 14.9% had a female householder with no husband present, and 29.0% were non-families. 26.1% of all households were made up of individuals and 11.8% had someone living alone who was 65 years of age or older. The average household size was 2.47 and the average family size was 2.96. In the county, the population was spread out with 21.4% under the age of 18, 11.0% from 18 to 24, 23.7% from 25 to 44, 27.6% from 45 to 64, and 16.2% who were 65 years of age or older. The median age was 40.3 years. For every 100 females there were 94.1 males. For every 100 females age 18 and over, there were 90.7 males. The median income for a household in the county was $23,673, and the median income for a family was $34,934. Males had a median income of $43,594 versus $21,897 for females. The per capita income for the county was $18,779. About 14.3% of families and 18.5% of the population were below the poverty line, including 25.9% of those under age 18 and 12.5% of those age 65 or over. As of the 2000 census, there were 24,209 people, 9,384 households, and 6,906 families residing in the county. The population density was 26 people per square mile (10/km²). There were 10,615 housing units at an average density of 12 per square mile (4/km²). The racial makeup of the county was 69.78% White, 27.10% Black or African American, 0.21% Native American, 0.18% Asian, 0.05% Pacific Islander, 1.73% from other races, and 0.96% from two or more races. 3.21% of the population were Hispanic or Latino of any race. There were 9,384 households out of which 33.60% had children under the age of 18 living with them, 56.80% were married couples living together, 13.00% had a female householder with no husband present, and 26.40% were non-families. 23.90% of all households were made up of individuals and 11.20% had someone living alone who was 65 years of age or older. The average household size was 2.55 and the average family size was 3.02. In the county, the population was spread out with 26.80% under the age of 18, 8.30% from 18 to 24, 27.20% from 25 to 44, 23.90% from 45 to 64, and 13.80% who were 65 years of age or older. The median age was 36 years. For every 100 females there were 93.30 males. For every 100 females age 18 and over, there were 90.60 males. The median income for a household in the county was $31,758, and the median income for a family was $37,370. Males had a median income of $35,089 versus $19,501 for females. The per capita income for the county was $15,702. About 13.90% of families and 17.50% of the population were below the poverty line, including 25.70% of those under age 18 and 17.20% of those age 65 or over. As of 2010 Ashley County had a population of 21,853 people. 68.19% of the population were non-Hispanic whites, 25.81% were blacks, 0.32% Native Americans, 0.18% Asians and 4.89% Hispanics or Latinos. In 2000, the largest denominational group was the Evangelical Protestants (with 16,752 adherents) and Mainline Protestants (with 1,817 adherents). The largest religious bodies were The Southern Baptist Convention (with 11,398 members) and The American Baptist Association (with 2,890 members). Educational attainment in Ashley County is typical for a rural Arkansas county, with a 2012 study finding 84.9% of Ashley County residents over age 25 held a high school degree or higher and 13.2% holding a bachelor's degree or higher, compared to Arkansas statewide averages of 84.8% and 21.1%. Ashley County is significantly below national averages of 86.7% and 29.8%, respectively. Two public school districts are based in Ashley County; Hamburg School District is the largest school district in Ashley County, with the Crossett School District serving the west side of the county. Successful completion of the curriculum of these schools leads to graduation from Hamburg High School or Crossett High School, respectively. Both high schools are accredited by the Arkansas Department of Education (ADE). A small area in eastern Ashley County is served by the Lakeside School District, which is based in Lake Village. There are no institutions of higher education in Ashley County. The nearest public community college is Louisiana Delta Community College in Bastrop, Louisiana, followed by South Arkansas Community College in El Dorado. Nearby public four-year universities include University of Arkansas at Monticello, University of Louisiana at Monroe, and Louisiana Tech University in Ruston, Louisiana. The University of Arkansas at Monticello's College of Technology—Crossett, formerly the Forest Echoes Technology Institute, is located between North Crossett and Hamburg and offers associate degrees in general and industrial technology and technical certifications in a number of medical and technical programs. Ashley County has two libraries: the Ashley County Library in Hamburg and Crossett Public Library in Crossett. Both institutions offers books, e-books, media, reference, youth, business and genealogy services. Ashley County's above-average poverty rate also indicates a high Medicaid eligibility rate. As of 2012, 35.3% of Ashley County was eligible for Medicaid, with 72.5% of children under 19 eligible for ARKids First, a program by the Arkansas Department of Human Services that combines children's Medicaid (ARKids A) and other programs for families with higher incomes (ARKids B). The county's population is significantly above healthy weight, with 71.9% of adults and 39.8% of children/adolescents ranking as overweight or obese, above the state averages of 67.1% and 39.3%, themselves significantly above national averages of 62.9% and 30.3%, respectively. The Ashley County Medical Center in Crossett is the nearest medical center offering acute inpatient care, emergency care, diagnostics, general surgery, orthopedic surgery, OB/GYN, rehabilitation, therapy, and senior care services. The facility is rated as a Level 4 Trauma Center by the Arkansas Department of Health. The nearest Level 1 Trauma Centers are Arkansas Children's Hospital and University of Arkansas for Medical Sciences, both in Little Rock. The Ashley County Sheriff's Office is the primary law enforcement agency in the county. The agency is led by the Ashley County Sheriff, an official elected by countywide vote every four years. The county is under the jurisdiction of the Ashley County District Court, a local district court. Local district courts in Arkansas are courts of original jurisdiction for criminal, civil, small claims, and traffic matters. Local district courts are presided over by an elected part-time judge who may privately practice law. The district court has two departments, Crossett and Hamburg. Superseding district court jurisdiction is the 10th Judicial Circuit Court, which covers Ashley, Bradley, Chicot, Desha, Drew counties. The 10th Circuit contains three circuit judges, elected to six-year terms circuitwide. The county government is a constitutional body granted specific powers by the Constitution of Arkansas and the Arkansas Code. The quorum court is the legislative branch of the county government and controls all spending and revenue collection. Representatives are called justices of the peace and are elected from county districts every even-numbered year. The number of districts in a county vary from nine to fifteen based on population, and district boundaries are drawn by the Ashley County Election Commission. The Ashley County Quorum Court has eleven members. Presiding over quorum court meetings is the county judge, who serves as the chief operating officer of the county. The county judge is elected at-large and does not vote in quorum court business, although capable of vetoing quorum court decisions. Property tax is assessed by the Ashley County Assessor annually based upon the fair market value of the property and determining which tax rate, commonly called a millage in Arkansas, will apply. The rate depends upon the property's location with respect to city limits, school district, and special tax increment financing (TIF) districts. This tax is collected by the Ashley County Collector between the first business day of March of each year through October 15th without penalty. The Ashley County Treasurer disburses tax revenues to various government agencies, such as cities, county road departments, fire departments, libraries, and police departments in accordance with the budget set by the quorum court. Sales and use taxes in Arkansas are voter approved and collected by the Arkansas Department of Finance and Administration. Arkansas's statewide sales and use tax has been 6.5% since July 1, 2013. Ashley County has an additional sales and use tax of 1.50% since July 1, 2010. Within Ashley County, the City of Crossett has an additional 2.25% sales and use tax since January 1, 2014, and Fountain Hill, Hamburg, Portland, and Wilmot have a 1.00% sales and use tax rate. The Arkansas State Treasurer disburses tax revenue to counties/cities in accordance with tax rules. The Ashley-Chicot Electric Cooperative, based in Hamburg, is a non-profit electric utility cooperative serving the rural areas of Ashley County with electric service, as well as parts of adjacent counties. Entergy Arkansas provides electricity for the cities of Hamburg and Crossett and nearby populated outlying areas, and to the small communities along US 165. The Arkansas Department of Health (ADH) is responsible for the regulation and oversight of public water systems throughout the state. Ten community water systems are based in Ashley County: the Crossett Water Commission, Fountain Hill Waterworks, Hamburg Waterworks, Montrose/Boydell Water System, North Crossett Utilities, Northeast Crossett Water Association, Parkdale Waterworks, Portland Waterworks, Wilmot Waterworks, and the West Ashley County Water Association. All use groundwater as the source. [Note 2] The Crossett Water Commission has the largest direct retail population served (8,038, all in Ashley County), followed by Hamburg (5,481), and North Crossett Utilities (2,924). The remaining water systems have under 1,000 retail population served. ^ Mileages from Ashley County to Monroe, Little Rock, and Jackson are based on highway miles using county seat Hamburg for Ashley County. ^ Northeast Crossett purchases from North Crossett and West Ashley County purchases from the Crossett Water Commission. ^ a b c d Arkansas State Highway and Transportation Department in cooperation with the U.S. Department of Transportation (October 16, 2014). Arkansas County Polygons (SHP file) (Map). Arkansas GIS Office. Retrieved March 20, 2019. ^ "Google Maps (Search for Hamburg, AR)". Google. Retrieved April 29, 2017. ^ "Mound Investigation Combines Technology, Archeology". Ashley County Ledger. Hamburg: Ashley County Publishing Co. Inc. November 12, 2009. Retrieved March 24, 2019. ^ Kelley, Deirdre; Norman, Bill (July 14, 2016). "Ashley County". Encyclopedia of Arkansas History and Culture. Butler Center for Arkansas Studies at the Central Arkansas Library System. Retrieved March 24, 2019. ^ Arkansas Atlas and Gazetteer (Map) (Second ed.). Yarmouth, Maine: DeLorme. 2004. § 63–64. ISBN 978-0-89933-345-8. OCLC 780322182. ^ "Wildlife Management Area Details". Beryl Anthony Lower Ouachita WMA. Little Rock: Arkansas Game and Fish Commission. 2011. Retrieved April 29, 2017. ^ GIS Division (September 2006). Beryl Anthony Lower Ouachita WMA (PDF) (Map). Little Rock: Arkansas Game and Fish Commission. Retrieved April 29, 2017. ^ Transportation Planning and Policy Division (November 16, 2007). General Highway Map, Ashley County, Arkansas (PDF) (Map). 1:62500. Little Rock: Arkansas State Highway and Transportation Department. Retrieved April 29, 2017. ^ GIS Division (September 2014). Casey Jones WMA (PDF) (Map). Little Rock: Arkansas Game and Fish Commission. Retrieved April 29, 2017. ^ "Wildlife Management Area Details". Casey Jones WMA. Little Rock: Arkansas Game and Fish Commission. 2011. Retrieved April 29, 2017. ^ "Wildlife Management Area Details". Little Bayou WMA. Little Rock: Arkansas Game and Fish Commission. 2011. Retrieved April 29, 2017. ^ "American FactFinder". United States Census Bureau. Retrieved March 20, 2019. ^ "Selected Economic Characteristics". United States Census Bureau. 2010. Retrieved March 20, 2019. ^ "County Membership Reports". thearda.com. Archived from the original on 12 July 2011. Retrieved 2011-08-22. ^ "American Community Survey". United States Census Bureau. 2011–2015. Retrieved May 11, 2017. ^ "Profile" (2015), p. 56. ^ "Nutrition, Physical Activity and Obesity: Data, Trends and Maps". Centers for Disease Control and Prevention. Retrieved December 20, 2016. ^ "Designated Trauma Centers". Arkansas Department of Health. June 7, 2016. Retrieved May 12, 2017. ^ a b "Directory" (2017), p. 30. ^ Staff of the Arkansas Judiciary (September 2, 2014). "Arkansas Court Structure" (PDF). Arkansas Judiciary. Retrieved December 26, 2016. ^ "Directory" (2017), p. 14. ^ "Ashley County". Association of Arkansas Counties. Retrieved April 30, 2017. ^ Teske, Steven (March 24, 2014). "Quorum Courts". Encyclopedia of Arkansas History and Culture. Butler Center for Arkansas Studies at the Central Arkansas Library System. Retrieved January 23, 2016. ^ Goss, Kay C. (August 28, 2015). "Office of County Judge". Encyclopedia of Arkansas History and Culture. Butler Center for Arkansas Studies at the Central Arkansas Library System. Retrieved January 23, 2016. ^ "State Tax Rates". Arkansas Department of Finance and Administration. Retrieved December 19, 2016. ^ "List of Cities and Counties with Local Sales and Use Tax" (PDF). Arkansas Department of Finance and Administration. October–December 2016. Retrieved April 30, 2017. ^ 2011 Boundary and Annexation Survey (BAS): Ashley County, AR (PDF) (Map). United States Census Bureau. Archived from the original (PDF) on 2012-10-19. Retrieved 2011-08-11. ^ "Summary Population and Housing Characteristics, CPH-1-5, Arkansas" (PDF). 2010 Census of Population and Housing. United States Census Bureau. September 2012. Retrieved May 31, 2014. ^ Electric Utility Service Territories (polygon) (Map) (Update ed.). Arkansas GIS Office. October 16, 2014 [June 5, 2009]. Retrieved April 7, 2019. ^ "Northeast Crossett Water Association Annual Drinking Water Quality Report" (PDF). Consumer Confidence Report. Little Rock: Arkansas Department of Health. 2017. Retrieved April 7, 2019. ^ "West Ashley County Water Association Annual Drinking Water Quality Report" (PDF). Consumer Confidence Report. Little Rock: Arkansas Department of Health. 2017. Retrieved April 7, 2019. ^ "Community Water System Data". Little Rock: Arkansas Department of Health, Engineering Section. Retrieved April 7, 2019. Staff of the University of Arkansas Division of Agriculture Research and Extension (2015). "Rural Profile of Arkansas" (PDF). Little Rock: University of Arkansas Cooperative Extension Services. Retrieved December 5, 2016. Staff of the Arkansas Judiciary (April 18, 2017). "Arkansas Judicial Directory" (PDF). Little Rock: Arkansas Judiciary. Retrieved May 12, 2017.